KDWB’s Dave Ryan Attends Permit Class! 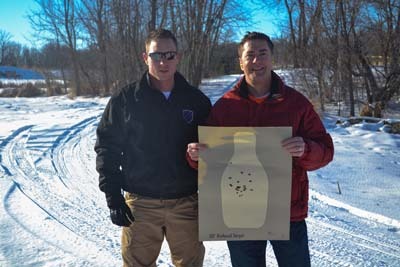 Blue Line Defense has had the honor of training individuals of all backgrounds from first time shooters to seasoned veterans and even local celebrities. Dave Ryan from the Dave Ryan in the Morning Show joined Blue Line Defense in the classroom today to complete a permit to carry course. Although Dave has been shooting since he was just a kid, he was excited for the opportunity for further hone his skills and complete training for his Minnesota permit to carry. Dave has been shooting handguns since he was five years old. He reminisced about his fond childhood memories growing up when his dad would take Dave and his brother out to shoot .22 handguns in Colorado. These memories are some that Dave will never forget and he looks forward to creating and sharing similar memories with his son, Carson. His father carried a 45-caliber pistol as his sidearm when he served in World War II and the pistol was handed down to Dave; he brought it with him today to show us! It has custom grips that his dad added; one that features a photo of Dave’s mother at age 19, and the other grip has his dad’s signature carved into it. Dave holds the same grips that were with his father through countless places that he traveled to while in the military. The gun is a great heirloom that will be passed down and treasured by members of his family. Joining twenty other students in the class, Dave learned about critical firearm incidents, legal implications for permit holders, how to develop a personal protection plan and many more topics that were led by instructors Matt Wyatt and Terry Pretzloff. After the completion of the classroom instruction, Dave and the other students got some quality time on the gun range practicing handgun fundamentals. Dave enjoys spending time at the shooting range and although he doesn’t get the opportunity to go as often as he’d like, he was a great shot! Students also got to see several different types of ammunition misfires and how to properly clear these malfunctions. Even though he has been shooting for decades, Dave mentioned that he learned an incredible amount in the classroom. He said it was surprising how much he thought he knew about handguns, but in reality how little he actually knew prior to the class. 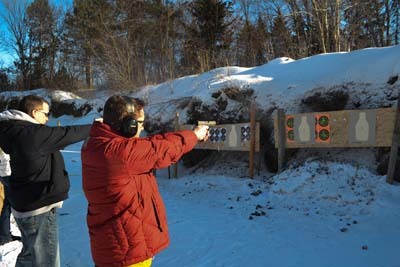 The knowledge he took in about different stances and grips, Minnesota firearm laws and other handgun tactics will enable him to be a better shot and a responsible permit holder. 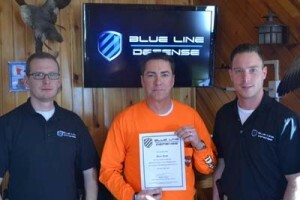 Dave left excited and looks forward to taking future firearm training courses with Blue Line Defense. We were honored to have Dave join us today especially because we’re big fans of KDWB’s Dave Ryan in the Morning Show and several members of our staff have been lifelong listeners. After over 25 years in the spotlight and creating one of the most listened to radio shows in the country, Dave Ryan is a true professional and one of the nicest guys we’ve ever met. In the midst of all of the negative media hype around firearms, it’s good to have a firearm advocate like Dave Ryan. You can listen to Dave’s show every morning from 6-10am on 101.3 KDWB and see more photos from Dave Ryan’s Permit to Carry class here.